British beauty Kelly Brook is one of those stars who has worked hard in the entertainment industry for many years and, while she has enjoyed plenty of success along the way, she has never really become a huge global superstar. With that said, we have followed Kelly for her whole career and while we would love to see her doing more acting and modelling, we are actual intrigued with what she spends her days doing now. 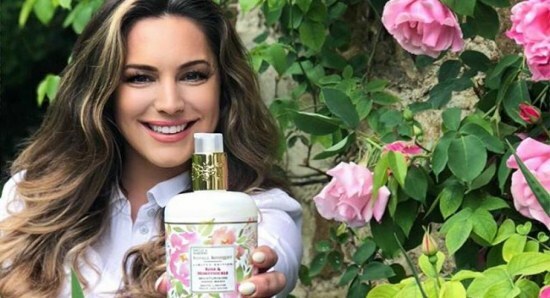 Kelly Brook has become a keen country girl and likes to spend a lot of time in her garden, so it was no surprise that she has been spending some time at the Chelsea Flower Show, which has been taking place this week. One of the issues with the Chelsea Flower Show, is managing to keep yourself clean, but Kelly has shared one of her top secrets for doing just that. Brook took to her social media accounts to share a picture of exactly what she has been using, along with the caption, "What a week at Chelsea Flower Show! I’ve been keeping my “green-fingers” clean using @baylisandhardingplc’s Royale Bouquet Rose & Honeysuckle Luxury Hand Wash, it smells as good as the show itself! Which garden was your favourite this year? #keepinglifebeautiful #chelseaflowershow #ad #MyGarden #kentlivingwithkelly." While we do love to see the modelling pictures from Kelly Brook, we have to admit that we have really enjoyed getting to follow her on her journey into the world of gardening. Kelly clearly enjoys what she is doing and we would love to see her getting her own gardening television show in the future.